Nine music makers of mixed ability use sound to explore new realms of possibility in a creative space free of social and physical barriers. Over nine hours a soundscape is produced using found sounds gathered from habitats where constriction does exist. A live performance acts as a metaphor for artists and audience to experience possibility outside of everyday structures and frameworks. 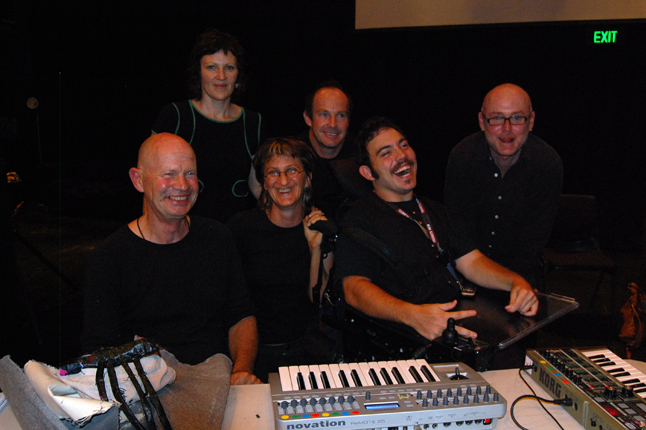 Conceived and coordinated by artists Jacqui O’Reilly and Randolf Reimann, enabling music makers of mixed ability access to modern synthesis techniques – to inhabit a new place of sound. Emerge Outside is part of the ClubHouse, a new program of critical dialogue, creative exchange, conversation and revelation about interdisciplinary arts at the Performance Space, CarriageWorks, Eveleigh NSW Australia. Vocal chorus by Jacqui O’Reilly. Arrangement by Randolf Reimann and Jacqui O’Reilly. Projected artwork by Brad Munro. Electronic set up by Tra La La Blip.